What's Up? 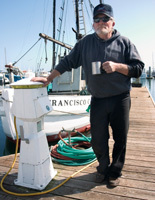 Docked: Fisherman Bob Longstreth in front of his boat at the harbor in Half Moon Bay. Many salmon boats were idle on May 1, one of the worst opening days of salmon season anyone could remember. Bay Area salmon fishermen were able to make the local catch a coveted piece of Northern California culture. But they weren't able to keep the government from screwing up the salmon supply and then making them take the fall for it. Welcome to this year's salmon season, where everybody loses. AND things were going so well. Faced with competition from multinational fish farms and sagging prices, Bay Area salmon fishermen banded together a few years ago to launch a campaign to educate the public about the health and culinary benefits of locally caught wild king salmon, one of Northern California's signature fresh foods. It worked. Savvy consumers began asking whether the salmon on restaurant menus was wild or farmed or, better yet, locally caught. Sales of salmon right off fishermen's boats at the Santa Cruz and Pillar Point harbors were booming, giving hardscrabble commercial fishermen top dollar for their catch without having to go through middlemen. Tapping into the Bay Area's growing taste for all things local, organic and eco-friendly, the wild salmon campaign was a win-win-win. Fishermen were getting a premium for their fish. Consumers were getting their hands on a fresh local delicacy. And while other fish species were in decline because of overharvesting and poor management, the Pacific salmon fishery was touted as environmentally sound. But then the Bush administration screwed it all up. May 1 was opening day for the 2006 salmon season. High winds and big seas kept most fishermen off the water. In Pillar Point Harbor (near Half Moon Bay) and Santa Cruz, it was one of the worst season openers in recent memory. "It's not much of an opener at all," said Pillar Point Harbormaster Dan Temko as he surveyed the idle fleet of salmon trollers. But more than the weather, recently approved fishing restrictions are what really drained the life out of what is typically a celebratory event. Late last month, the federal government approved deep cuts in the salmon season in California and Oregon, cutting the typically five- to six-month season by 60 percent. The decision may put many fishermen out of business and cause untold damage to the state's $100 million salmon fishing industry. The restrictions come on the heels of a 2005 season that was also severely limited. For consumers hungry for local salmon, the restricted season means the fish will be scarce and, when available, very expensive. Last week Whole Foods in Los Gatos was selling local salmon for $25.99 a pound. Other markets such as San Jose's Race Street didn't have any at all. "The local market is going to be really weak," said Eric Conover, manager at Race Street. "We'll bring in what we can." King salmon, also known as Chinook, typically sells for about $12 a pound. As a result of the slashed season, markets and restaurants will offer Alaska-caught salmon and farmed salmon, a cheaper but inferior-tasting product fraught with environmental problems. Many fishermen fear that scarcity and high prices may drive consumers back to farmed salmon which sells for a third of wild salmon. "California king salmon is one of those products that we definitely look forward to," said Bart Hosmer, executive chef at Santa Clara's Parcel 104, a restaurant that seeks out locally caught, sustainably harvested fish. King salmon is part of the Bay Area's food culture and going without it would hurt, he said. "It would be such a great loss." Hosmer is one of 30 chefs participating in the Monterey Bay Aquarium's annual "Cooking for Solutions" later this month, an event that showcases cooking with sustainably harvested fish. But the king salmon, one of Monterey Bay's star fish, may be in short supply. The reason for the restricted season is to help restore the Klamath River's critically low salmon population. Klamath salmon swimming offshore mingle with the far more numerous Sacramento River salmon, so to protect Klamath fish the truncated season is necessary, regulators say. Fishermen counter that Sacramento salmon vastly outnumber the Klamath fish and the effect of fishing would be minimal. They say the restrictions are unfair and based on bogus science and venal politics. The decision to cut the season, made by the National Oceanic and Atmospheric Administration's (NOAA) Fisheries Service, upholds the recommendation made by the Pacific Fishery Management Council. As it stands now, 700 miles of some of the best fishing grounds between Santa Cruz and Oregon are off-limits. Through the month of May, fishermen will be restricted to south of Pigeon Point (near Pescadero in San Mateo County) and pushed even further south come June. After June 26, fishing will be allowed up to Point Arena (Mendocino County). Add in a 75-fish-per-week limit and the high cost of diesel (now about $3 a gallon) and you've got the makings of a disastrous season. In a press release statement, Rod McInnis, director of NOAA Fisheries Southwest Region, said he felt the fishermen's pain and was pleased the season wasn't entirely shut down. "We are acutely aware of the impact this rule has on fishermen and coastal communities, but feel this is a necessary step to ensure the long-term health of the salmon fishery." Pillar Point fishermen Bill Webb sat dejectedly on his boat and contemplated what he predicted would be a grim season. He and the other fishermen gathered near his boat didn't have much to do besides watch the photo shoot of a woman in a bikini on the next dock. Actually, they'd probably watch it anyway, but they were still pissed. "I should have run the fucker up on the beach instead of putting all that money into it," Webb grumbled as he fiddled with the rigging of his boat, the Cricket. "I'm going to take my boat down south, way down south, and get something I can really make some money on." Fellow fisherman Dan Furtado, who wore a crab claw necklace and a devilish grin, chimed in. "I'm going to go into the mermaid business and start filleting them." One of the few fishermen to go out on opening day was Duncan MacLean. After more than 24 hours on the water he came back with a meager catch. He knows the fish are out there, but the shortened season and 75-fish limit will make it hard to make a living. "I know a lot of guys who didn't rig up to go fishing this year because 75 fish isn't worth it," he said. MacLean, a lean man with a deeply creased face, says decisions like the 75-fish-a-week limit were not made with proper public input and smack of backroom politics. "They're in violation of their own rules," he said. What's more, he says the sport fishing season in the Bay Area largely escaped the restrictions. A chartered party boat can catch more fish in one day than a commercial fisherman can all week. "Don't even go there," he said grimly. Fishermen blame the Bush administration and say they alone are being made to pay for the federal government's bad decisions. Because of toxic agricultural runoff into the Klamath and water diversions to irrigate the parched, high desert climate of the Klamath Basin along the California-Oregon border, what was once the third most productive salmon river on the West Coast is gasping for breath. Things really went belly up in 2002. Fishermen, American Indians and Klamath Basin farmers have often been at odds over water rights and salmon management along the Klamath River. But when the Bush officials waded in, almost all parties agree they turned a bad situation into an economic and environmental disaster. In what is now a well-known story, upper Klamath Basin potato and sugar beet farmers were faced with a drought in 2002 and demanded that more water be released from the river to irrigate their crops. The feds had denied them previously in order to protect the endangered Coho salmon and growers staged a very vocal protest over what they say were fish-over-farmer policies. But 2002 was an election year and the farmers had a friend in U.S. Sen. Gordon Smith, an Oregon Republican seeking re-election. According a 2003 article in the Wall Street Journal, Karl Rove took a keen interest in Smith's re-election. After Rove and President Bush visited Smith and learned of the farmers' demand to divert water from the river for their farms, Rove reportedly leaned on the U.S. Department of the Interior and the U.S. Bureau of Reclamation to do just that, overruling National Marine Fisheries Service findings that reduced water flows would jeopardize the endangered Coho salmon and other salmon in the river. But a few months later, Sen. Smith and former Secretary of the Interior Gale Norton opened the floodgates and sent water flowing out of the river to Oregon farmers. What happened next shouldn't have come as much of a surprise. Low water levels and warm temperatures that spring are believed to have spawned parasites that killed tens of thousands of juvenile salmon heading out to sea. In September, as many as 80,000 salmon returning to the river to spawn died in conditions attributed to the siphoned river. It was the largest fish kill ever recorded on the West Coast. On the up side, Sen. Smith was handily reelected. At a Loss: Santa Cruz fisherman Hans Haveman (left) says this tough season is ruining the public's appreciation for locally caught salmon. 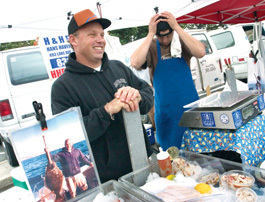 Santa Cruz fisherman Hans Haveman has become a fixture at farmers markets in Santa Cruz, Campbell, Oakland and elsewhere. At the farmers market in Santa Cruz last week, he was selling tuna, halibut, black cod, Dungeness crab and Alaskan salmon. But no local salmon. Several customers walked away when they learned he didn't have the local stuff. "This is the first year I haven't had the local product," he said ruefully. "It's become part of our local culture." Fishermen are used to dealing with new regulations and most will find a way to adapt, he said. To cope, he'll bring in more local halibut and Alaskan salmon. On the bright side, heavy rains this past winter are expected to increase flows in the Klamath and may boost the number of returning salmon and pave the way for more relaxed regulations next year. And Haveman said he may be able to give Santa Cruz's young fishermen for whom 75 fish a week is a good haul a decent price for their salmon—when they can find it, that is. As he spoke, several people walked up and congratulated him on his wife's and his new baby girl, Dahlia. He also recently purchased a home, which will make the season even harder to take. "I'm going to lose money," he said, his voice trailing off. With local wild king salmon in short supply this year, consumers might want to seek out alternatives. When available, locally caught halibut, albacore tuna, white sea bass, petrale sole and black cod are good options. Many fishermen who typically concentrate on salmon will be looking to supplement their catches with these fish. For a complete list of environmentally sound fish choices, check out the Monterey Bay Aquarium's "Seafood Choices" consumer guide at mbayaq.org/cr/seafoodwatch.asp. Their "Best Choices" include abalone (farmed); albacore tuna (troll/pole); bigeye tuna (troll/pole); catfish (farmed); caviar (farmed); clams (farmed); Dungeness crab; imitation crab (U.S. caught from Alaska); mussels (farmed); oysters (farmed); Pacific cod (bottom longline and traps); Pacific halibut; pollock (U.S. caught from Alaska); pink shrimp (Oregon); rainbow trout (farmed); sablefish/black cod (Alaska and British Columbia); salmon (wild-caught Alaska); sardines; snow crab (Canada); spiny lobster (U.S. and Australia); spot prawn (British Columbia); striped bass (farmed or wild-caught); sturgeon (farmed); tilapia (farmed); white sea bass; yellow fin tuna (troll/pole). The "Avoid" list is clear: Atlantic cod; blue fin tuna; caviar (wild-caught); Chilean sea bass; grenadier (U.S. Pacific Ocean); king crab (Russia); monkfish; orange roughy; Patagonian toothfish; rockfish (trawl-caught); salmon (farmed); shark; shrimp (imported); spiny dogfish (U.S., Canadian Atlantic); sturgeon (imported wild-caught); swordfish (imported).